Enable a seamless payment experience in different global regions for both PayPal and non-PayPal buyers. Cross border eCommerce is growing rapidly with the increase of online retailers looking to sell their products internationally and reach more customers around the globe. Although the global market is broad, site payment methods have generally been limited. While there are a few known payment methods that may work in several major regions such as North America, Europe, and Latin America, the ability to account for localized payment methods across different regions can be a challenge. 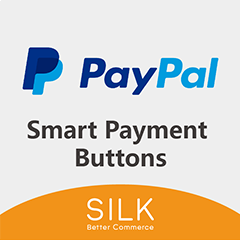 With PayPal Smart Payment Buttons, buyers are provided with the free and secure payment methods they need to successfully complete transactions across the different regions they are located in, whether they are a PayPal buyer or non-PayPal buyer. Merchants are able to gain valuable data to help better understand the user behavior on their site. When customers step into the checkout flow, there will be localized payment methods available for usage based on different regions, which can be identified according to the addresses they have inputted in advance. Available on both mobile and web browsers, buyers are provided with a direct process to complete payment within a pop-up window, rather than having to leave the current page for checkout. By utilizing this tool, merchants can provide a seamless payment experience for PayPal and non-PayPal buyers while optimizing their conversion rates. To address this need, the SILK team has created an extension on the Magento Marketplace. which will enable merchants to apply payments through PayPal gateways. This includes not only PayPal payment methods, but also other localized payments. To learn more about PayPal Smart Payment Buttons or discover more cross-border tools that you can utilize for your business, please feel free to contact us.